Episode 81 - February 18, 2009 - Interview with Brian "The Monk"
Episode 75 - October 24, 2008 - Jeff Belanger and Who's Haunting the White House? Halloween Promo - October 31, 2007 - Halloween 2007 Promo - Be sure to tune in! Episode 47 - September 19, 2007 - Ghost Hunters Spotlight - C.A.S.P.R. Episode 12 - January 17, 2007 - EVP, Featuring Tom and Lisa Butler of the A.A.E.V.P. Ghost Chronicles is a weekly podcast that features interviews from some of the biggest names in the field of paranormal research, news roundups, and field reports from investigators all over the world. 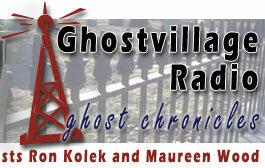 The show is uploaded each Monday and is hosted by Ron Kolek and Maureen Wood of the New England Ghost Project.